Sterling Silver "Love the Life You Live" Charm with Round Pink Crystal Pendant Only $11.99! Down From $79.99! You are here: Home / Great Deals / Sterling Silver “Love the Life You Live” Charm with Round Pink Crystal Pendant Only $11.99! Down From $79.99! 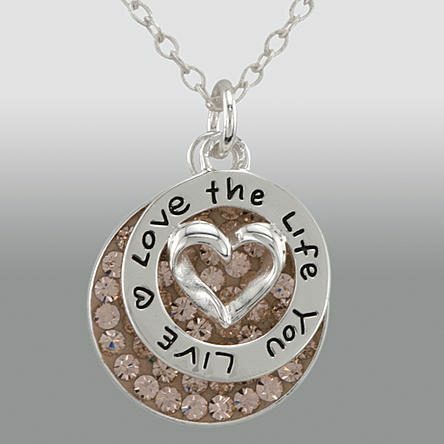 Sterling Silver “Love the Life You Live” Charm with Round Pink Crystal Pendant Only $11.99! Down From $79.99! Sears has this Sterling Silver “Love the Life You Live” Charm with Round Pink Crystal Pendant on sale for $11.99! (Reg. $79.99)! Plus shipping is FREE on orders over $30 or FREE in-store pick up! Sterling Silver “Love the Life You Live” Charm is beautiful with a round pink crystal pendant making. With the beautiful round shaped pink crystal design glass pendant will go with so many different pieces of your wardrobe. This Pendant is a much have accessory for all your various styles.